3rd December 2013 The Havant Symphony Orchestra made a welcome return to Oaklands School, whose warm and sympathetic acoustic always makes the music sound well.… See our Reviews page for a link to Terry Barfoot's review of the November HSO concert at Oaklands School, published in the Portsmouth News. 23rd November 2013 The Havant Orchestras Newsletter for November 2013 is now available, including additional information about the HSO concert at Oaklands School, Waterlooville, on 30th November. 21st October 2013 See our Reviews page for a link to the review of the October HCO concert, by Mike Allen, published in the Portsmouth News. 11th October 2013 The Havant Orchestras Newsletter for October 2013 is now available, including additional information about the HCO concert on 19th October. Some of the evening’s events were finalised too late to make the printed version. The latest news is that we can confirm there will be a pre-concert talk in the auditorium at 6:30pm (given by Piers Burton-Page), an Upbeat Club meeting in the inner foyer at 6:30pm, and a pre-concert interlude in the Octagon Lounge at 7pm. 23rd September 2013 We had a packed house for our very successful HSO Popular Classics concert in Hayling with Colin Jagger and Valentina Seferinova! See our Reviews page for a link to the review by Mike Allen, published in the Portsmouth News. 14th September 2013 We are very pleased that Levon Parikian has accepted our invitation to conduct the HSO concert on 29th March 2014, after the conductor we had originally planned to invite turned out to be unavailable on that date. We had also been looking at the possibility of including a ‘Last night of the Proms’ selection as the second half of the July concert at Ferneham Hall, but have now decided that for practical reasons this idea would be much better suited to another venue such as Oaklands School, so we have deferred these plans to some future occasion and reinstated the previous programme, including the popular ‘Enigma Variations’. Now that these points are resolved, we finally have a complete main concert programme of works, soloists and conductors for the 2013-14 season. All of the details are now on the Concerts pages on this website, and we hope to be able to complete and print the long-delayed programme brochure for the season within a few days. Note that there will not be a combined programme book for the whole season as in previous years; for this season, we have decided to try printing separate programme booklets for each concert in order to evaluate the pros and cons of this alternative approach. Havant Symphony Orchestra will also be involved in at least one additional concert, a performance of a new concert version of ‘The Yeoman of the Guard’ with Colin Jagger on Saturday 22nd February 2014 at Portsmouth Guildhall. More details will be available soon. 14th September 2013 At the recent EGM and AGM, the new constitution was approved and a new committee was elected to take on the challenging job of running the Havant Orchestras following the retirement of Peter Craddock as Musical Director and Sandra Craddock as Administrator. Our recent acting Chairman, Becky Hill, has had to step down from the committee due to new work commitments. The new Chairman is Jonathan Scott (1st violin, HSO and HCO, and Webmaster), assisted by his wife Stella Scott (cello, HSO and HCO, and Playing Members’ Secretary) who had already arranged to take over Sandra’s Administrator role. We are grateful for the support of experienced committee members who have agreed to continue their current roles, including Gunther Oestreich as Hon Secretary, Brian Terry as Hon Treasurer and Tony Gutteridge as Orchestral Manager. To make it easier to manage external email contact while allowing for personnel changes within the committee, we have set up new email addresses for specific committee positions, including an overall general contact email address which goes to the administrator. See the Contacts page for details. More news from the AGM will appear in the October newsletter (before the HCO concert). As previously notified in the July Newsletter, an EGM of the Havant and District Orchestral Society will be held at 7.00pm on Friday 6 September 2013 at St Faith’s Church Hall, The Pallant, Havant, to be followed immediately by the AGM. All members of the Society (i.e. playing members and season ticket holders) are invited to attend. The purpose of the EGM is to approve a new constitution, a copy of which was distributed with the July newsletter. Our current constitution is 30 years old and no longer conforms fully to our needs. The new constitution is based on model constitutions from the Charity Commission and Making Music (the National Federation of Music Societies). Places are available on the committee and nominations for election may be sent to the Chairman in advance (with the names of candidate, proposer and seconder) or submitted at the meeting. Following the AGM, refreshments will be served and the evening will conclude with a rehearsal to which all non-playing members are invited. 10th July 2013 The student ticket price for the Hayling HSO September concert is £5.00, as it says on the tickets themselves, not £3.00 as appeared in the July newsletter due to a copying error (for which the newsletter editor apologises profusely). This incorrect price was unfortunately then faithfully reproduced on some posters and elsewhere on the assumption that the newsletter was correct! Our normal scheme is that students get a 50% discount on tickets, and the correct price is consistent with that scheme. David Le Page: Thank you @HavantOrchestra for the Glazunov last night. A great pleasure to work with you all. Hard to believe the last time was 1986! Tom Hammond: I thoroughly enjoyed it, what a lovely evening… Just can't decide WHICH tune to stop whistling this morning! For more comments on the concert and other interesting topics, check our Twitter feed (@HavantOrchestra) and see what else our soloist David Le Page (@dlpviolin) and guest conductor Tom Hammond (@Tomhammondmusic) had to say! 9th July 2013 See our Reviews page for a link to the review of the July HSO concert, by Mike Allen, published in the Portsmouth News. 7th July 2013 The Havant Orchestras concert programme for the 2013/14 season has now been updated with further details, including the programme for the Hayling concert and additional conductor and soloist details, and the 2013/14 season is now the current season on this website. Our musical director Peter Craddock put together a programme for the 2013/14 season many months ago, but as Peter’s continuing mobility problems meant that he would no longer be able to conduct any of the concerts himself, it seemed sensible that the guest conductors and the new committee should be offered the opportunity to suggest their own ideas for changes. It had been hoped that we could sort out the details and incorporate these ideas into a final programme and publish a summary brochure for the May concert as usual. However, the communications and meetings to resolve the details took much longer than expected, so we decided to publish the ‘Advance Brochure’ containing the provisional programme as it stood at the time, having at least confirmed all but one of the soloists. Most of the additional details have now been resolved, but the changes were more extensive than originally expected, and there are likely to be a few further minor changes. We also still have to fix another guest conductor after discovering that one of our intended guest conductors was no longer available on the concert date. We apologise for the delays in fixing this programme and the number of changes since the first version, but we hope that people will enjoy the revised programme. 29th June 2013 The Havant Orchestras Newsletter for July 2013 is now available, with additional information about the HSO concert on 6th July. 17th May 2013 Details of the provisional Havant Orchestras concert programme for the 2013/14 season are now available on this website, together with information about booking season tickets. The programme for the Hayling September concert will be announced later, as will further details about the other concerts, including conductors and the soloist for the March concert. 11th May 2013 The Havant Orchestras Newsletter for May 2013 is now available, with additional information about the HCO concert on 18th May. 18th March 2013 One phrase, above all, proved Andrew Morley to be a worthy candidate to succeed Peter Craddock as conductor of the HSO… See our Reviews page for a link to the review of the March HSO concert by Mike Allen published in the Portsmouth News. 8th March 2013 The Havant Orchestras Newsletter for March 2013 is now available, with additional information about the HSO concert on 16th March and other important news. 3rd February 2013 The Havant Orchestras Newsletter for February 2013 is now available, with additional information about the HCO concert on 9th February. 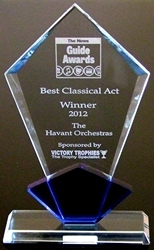 I am delighted to report that The Havant Orchestras won the Best Classical Act prize at last night’s ‘News’ Awards held at The Kings, Southsea. Our prize was presented by our good friend (and recent piano soloist) Peter Rhodes from South Downs College. We were up against five other finalists including: Solent Symphony Orchestra, Portsmouth Choral Union and The Renaissance Choir. This is the fourth ‘News’ Award ‘we’ have won including Peter’s Lifetime Achievement Award. Sandra, Lance Dearsley and I went to the ceremony where Sandra and I made a short, joint acceptance speech. There is coverage in tonight’s ‘News’ but sadly no photograph. This is another excellent accolade and comes hard on the heels of the equally excellent £4750 grant from Hampshire County Council. We have many challenges ahead but it is terrifically encouraging to get a boost from these two pieces of good news. Well done to everyone who contributes to and supports the Society in any way. In a change to previously published details, Peter Craddock’s mobility problems prevent him from conducting the concert and we are delighted that his place will be taken at relatively short notice by Robin Browning, conductor of the Petersfield Orchestra and Southampton University Symphony Orchestra. We wish Peter well and hope he will be able to conduct the May HCO concert. In the meantime we look forward to an exciting concert under Robin’s baton with Brian Howells and Rebecca Hill as soloists in Mozart’s ‘Sinfonia Concertante’.